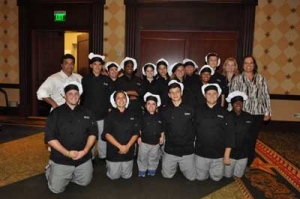 Once again the Texas School for the Deaf and its Foundation joined hands with the fabulous staff from Hilton Austin to host an unforgettable evening of fine food and wine, lively auctions and great camaraderie. Culinary Arts students, under the direction of Diamond Chef Mark Dayanadan, served an incredible meal including Mussel Soup Montgolfier, Flank Steak Roulade and Peach Tatin with Chocolate Pate and Strawberry Cream. Each course was paired with delightful wines specially selected by Jon Wolf, parent of two TSD students, who works for St. Michelle Estates. This year’s Partner of the Year Award was given to longtime TSD supporters, Alex & Toni Abadi, whose company, Image Microsystems, supports and employs students through the TSD work study program. The gala serves a dual purpose of showcasing the talents of our students and raising money for the school. This year’s silent and live auctions featured trips to Denmark and Florida, several golf outings, beautiful jewelry and exciting dining opportunities. A huge thank you to the Diamond Gala Committee whose year-long efforts helped create an exceptional evening.